PROS: Part of a series but each novel is a standalone; made me care enough about the characters that I cried during flashback scenes; unputdownable! CONS: There was a lot of drama going on for such a small, seemingly peaceful town; it seemed like this family had everything possibly going against them. Following a trauma that recently rocked their family, Eli and Noelle’s marriage is on the rocks. Eli has no idea what his wife gets up to when he’s out of the house, and now that he’s a retired cop he spends most of his time ice-fishing in order to avoid his family. Noelle is on the brink of making a decision that could tear her family apart when she’s involved in an accident that causes her to forget the last twenty-five years of her life. She wakes up in a hospital bed thinking she’s still at college, and she has no idea who Eli is and no recollection of their marriage or children. Eli realises that God has given him a second chance, the opportunity to get his marriage back on track. But can he make Noelle fall in love with him again before she figures out why their marriage went south in the first place? I make no secret of the fact that my guilty pleasure when it comes to novels is amnesia plots. Amnesia, snowbound and babies have to be my favourite romantic plot devices; but The Shadow of Your Smile isn’t exactly a romance novel. While Eli gets the chance to reromance his wife, this book also contains the stories of how Noelle’s family members and friends react to her amnesia; how it brings some of them together and pushes others apart. This novel reminded me of a modern day family saga, a Christian version of a Barbara Delinsky novel, where the reactions of family, friends and an entire town are detailed in relation to a dramatic event. In The Shadow of Your Smile we not only witness how Eli and Noelle come to reconcile their relationship, but also how their son, Kyle, a new cop, reacts to the incident that caused his mother’s amnesia and his relationship with his sister’s best friend, Emma. Emma’s mother is also heavily involved in the events in this book, as not only Noelle’s best friend but in her dangerously close relationship to Eli. I wasn’t sure whether I’d enjoy reading about a couple whose marriage had deteriorated after twenty-five years. I’m getting married in less than six months and I remember my experience of reading the first few chapters of Rob Parson’s The Sixty Minute Marriage, where I bawled to my fiancé about how there were all of these horrible things that could go wrong with our marriage. Sometimes you’re just not in the right frame of mind for reading about a topic close to your heart. But in this case, I was able to enjoy The Shadow of Your Smile without panicking about the “What Ifs?” presented in the novel. While this book deals with a lot of tough topics, it’s also very easy to read. The problems that the characters encounter are very realistic ones and the characters are so down-to-earth and normal that they could be your next-door-neighbours. This was my first experience with the Deep Haven series but the town really came alive to me in this book and I think that the setting of this novel will make readers feel at home, whether this is the first book in the series that they’ve read or the sixth. That said, I did feel a bit disorientated when I first began reading The Shadow of Your Smile. It was as if I’d been dropped right into the middle of Deep Haven and Eli and Noelle’s lives. It took a bit of adjusting to get used to all of the relationships and histories between the characters, and there were incidents in Eli and Noelle’s lives that were vaguely mentioned several times and it took me a while to finally figure out what had happened to push them apart. I actually went online and looked up the other Deep Haven novels to see whether there had been a previous novel about this family and whether I was missing some important details about their lives. 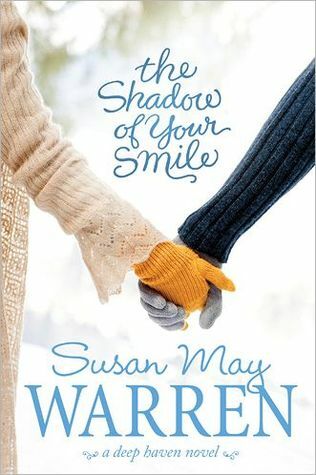 When I realised that all of the other books focused on completely different characters I started to wonder whether Susan had deliberately made The Shadow of Your Smile disorientating for the reader in order to make them sympathise with Noelle’s amnesia. To be honest, I was as confused as Noelle was in the opening chapters of the novel, and this made reading the book an even more interesting experience. As I figured out the missing pieces of Noelle’s life, so did Noelle. To any readers of the novel who may be confused to begin with, I urge you not to give up – this book is definitely worth all of the figuring out that you have to do! Despite my misgivings with the level of drama in this book, Susan May Warren also made me truly care about her characters. I finished reading this book on Christmas Day and was dabbing at my tears as Eli remembered his daughter’s accident. While this book had its flaws and didn’t have that special something that pushed its rating up to a 9 or 10, it was still a thoroughly enjoyable read. And while I will admit that this was an easy novel to breeze through in a couple of days, it had so much food for thought. It’s not possible to come away from this novel without musing over some point or another. I will definitely be going back and reading more of the Deep Haven books, and encourage fans of family sagas and contemporary fiction to start with The Shadow of Your Smile and do the same. Review title provided by Tyndale House.